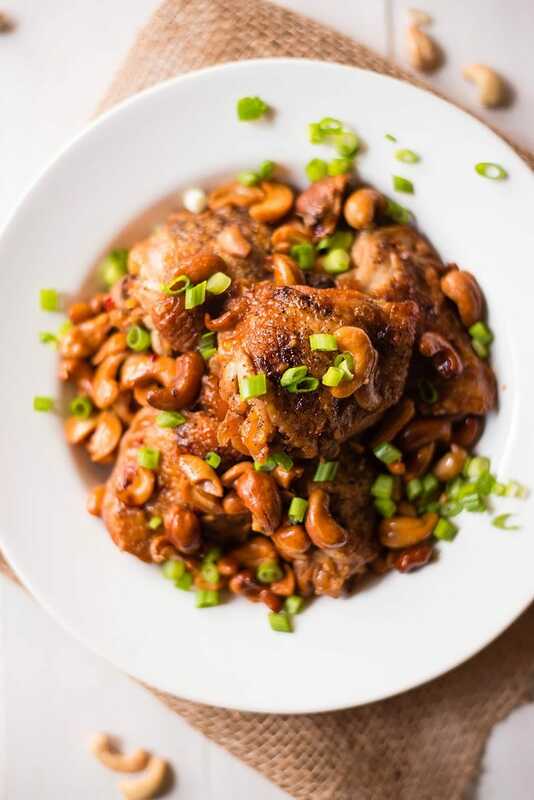 This easy Slow Cooker Cashew Chicken is quick to prep, better than takeout, and way healthier for you, too! Perfect for easy weeknight dinner and kid approved! Now that the weather is colder and slow cookers are being dusted off, several of the No-Fail Meals members have requested to have more slow cooker recipes included in the meal plans. Because meal plans + slow cookers = one easy peasy and delicious week of food! So, I went to work testing out tons of slow cooker recipes. Heck, I even bought an extra slow cooker to test twice as much. Well, it just so happened on day I was craving some Chinese food. AND I needed to test an easy slow cooker recipe. That’s right, friends: Put your hands together! And that is how this slow cooker cashew chicken came to be. Truth: this cashew chicken is amazeballs good. Another truth (and a random side note): I find it funny that my spellchecker has learned the word “amazeballs.” Do I say that a lot? Hmmm. Since testing this recipe and sharing it on No-Fail Meals, I get requests for it all the time. It’s one of those amazingly simple recipes that get you all excited about when they’re in the slow cooker because you know the delicious smell it’s giving off isn’t even a tenth of how delicious your meal will be in just a few short hours. Super simple. Super easy. High protein. Flavorful. Yep: amazeballs. Apparently I use that word a lot? Jury’s still out. 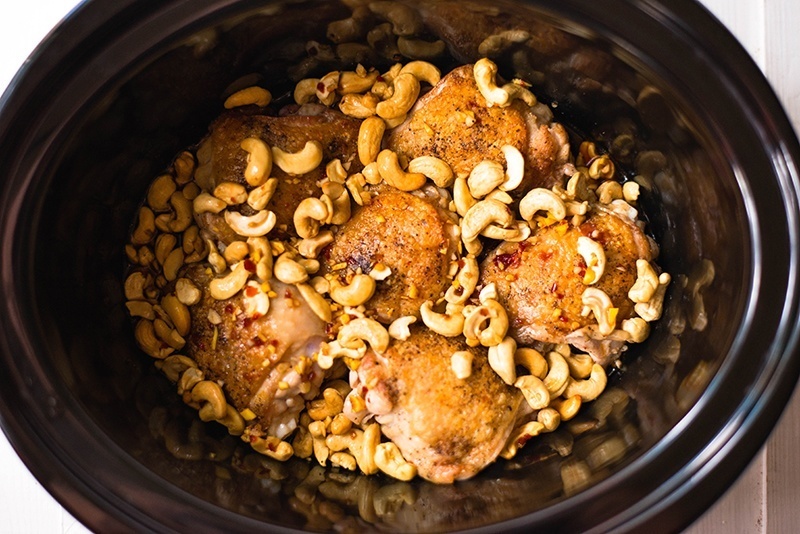 Is Slow Cooker Cashew Chicken Healthy? Alright, we all know and love cashew chicken. But we’re looking at a recipe on A Sweet Pea Chef so there’s gotta be a healthy component to this, right? Right! Cashew chicken can be a healthy option when dining at Chinese restaurants IF you practice portion control. 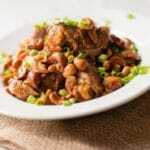 After about 1 cup of cashew chicken, however, the calories, sodium, and fat can quickly add up. That’s why making homemade cashew chicken is a great healthy choice. 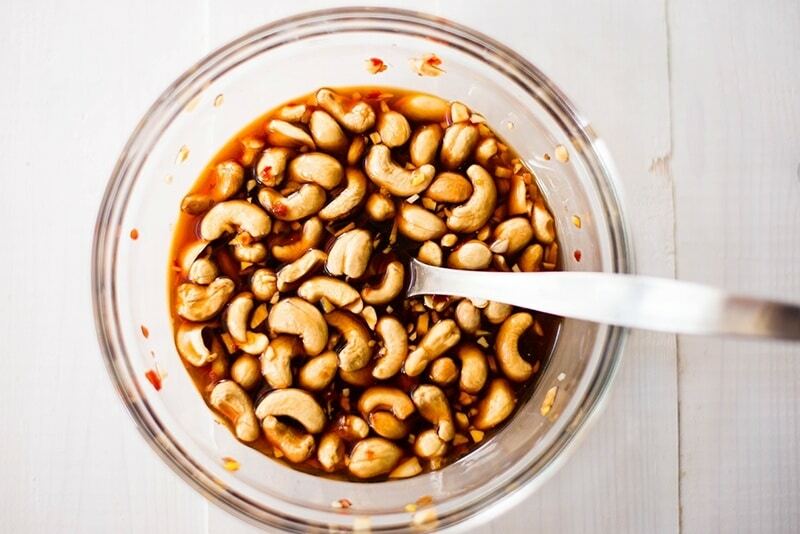 The biggest nutritional aspects to pay attention to when enjoying cashew chicken are the sodium (hello, soy sauce!) 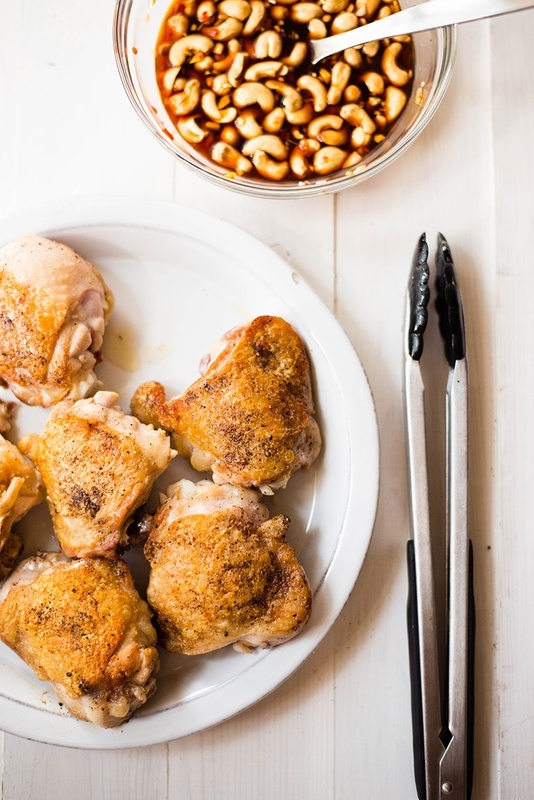 and fat (hello, cashews and chicken thighs!). That being said, one serving of this cashew chicken will still allow you to continue your healthy lifestyle and partake in yummy Chinese cuisine. Woot! If you’d prefer to reduce the saturated fat even further on this dish, you can always replace the chicken thighs with boneless, skinless chicken breasts. I find I like the flavor a tad better with skin-on, bone-in thighs, though I do remove the skin when I eat it to lessen the fat content and because the chicken already has so much flavor anyways. Making meals and freezing them into smaller portions for using later is a great idea, especially with slow cooker recipes since they make so many servings! It definitely helps on those crazy busy weeknight dinners or when I am out of ideas for what to make for dinner! To freeze cashew chicken, make the entire recipe as written below first. Then, allow to cool completely before portioning it into either several 1 quart freezer bags (individual servings) or 1 gallon freezer bag (family serving) or a freezer-safe container. If using freezer bags, make sure they are freezer safe and remove as much air as possible before sealing. If you’re wanting to turn this into an easy freezer meal to cook later, follow the directions to brown the chicken and make the cashew sauce, and then add everything into a freezer safe bag. When ready to cook, just add to a slow cooker and cook. Craving takeout, but still wanna stick to your healthy eating goals (and save the money on takeout)? Try these better for you, better than takeout recipes to get your fix. Want more easy, delicious, and healthy slow cooker recipes? Here ya go! This easy Slow Cooker Cashew Chicken is quick to prep, better than takeout, and way healthier for you, too! Heat a fry pan over high heat and add the oil. Season the chicken with salt and pepper and add to the hot pan. Cook until well-browned, about 2 minutes per side. Transfer browned chicken to the bowl of a slow cooker. 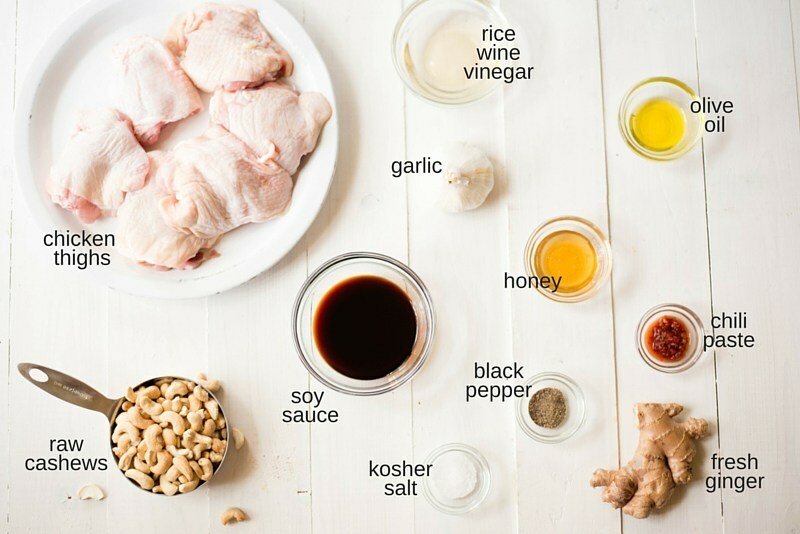 Combine the low sodium soy sauce, rice wine vinegar, chili paste, raw honey, garlic, ginger, and cashews in a small bowl and pour over the chicken. Cover and cook on Low for 3 to 4 hours. Top with sliced green onions. Serve over steamed brown rice, if desired. So I made this tonight after following the instructions provided. It turned out really well and I’m happy with the result but I would have to offer one bit of advice / constructive criticism. If you’re using a slow cooker that is as wide as mine is (I bought the ‘Crock-Pot 7.0-Quart Cook & Carry Programmable Slow Cooker’ from Costco a few weeks ago), by following the recipe provided the fluid will not cover all of the chicken. I had to add about 2 cups of water (in addition to ~1/2 cup of low-sodium soy sauce and 1/4 cup of rice wine vinegar) to raise the fluid level enough to cover all of the chicken. With that being said, it’s a great recipe and I’m happy to have all of this chicken for this week, but if you have a larger slow-cooker like mine, be ready to buy extra low-sodium soy sauce, rice wine vinegar, etc. to have the fluid level go above the chicken you put in. I’ll give it 5-stars, but just because the author probably used a smaller pot and it worked great for her. Be sure to adjust your recipe if you have a larger pot like mine. I’ve been so disappointed with crock pot recipes lately but when I took a bite of this one I was pleasantly surprised! It’s delicious!!! It actually tastes like cashew chicken from the best Chinese restaurant. I only wish the sauce was a bit thicker but I guess I could add cornstarch or flour? Thanks so much for the delicious recipe!!! Our family loved the recipe. Prepped ahead of time and put all the ingredients in a ziploc freezer bag. A few weeks later, defrosted overnight, popped the mixture into the slow cooker, and it made for an easy dinner. 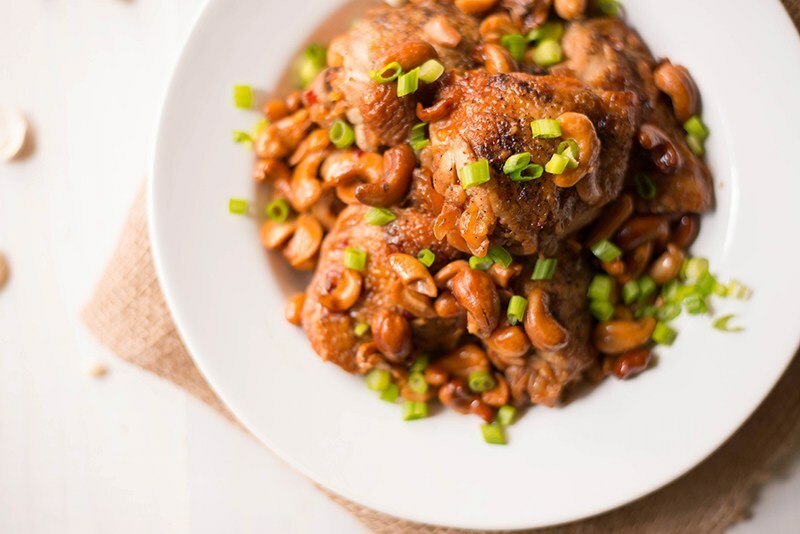 I don’t think I ever ate chicken with cashew before..curious to try it! Sorry about that confusion! Go with 1/2 cup, but 1/3 would have worked fine, too. My friend shared this recipe with me and I”m so glad she did. It is my favorite thing to make now! It is absolutely delicious. The flavors make my mouth water and you feel good after eating it. I always use organic chicken and it’s just delicious. Thank you for this recipe! Can’t find Rice Wine Vinegar for the life of me. Is it okay to substitute Rice Vinegar instead?? Anyone else having trouble finding Rice Wine Vinegar… I tried trader joes, Ralph’s Vons, the Asian section… only Rice Vinegar. Rice Wine Vinegar is always in the Asian section of the supermarket – near the sesame oil, fish sauce etc. I’d like to know what chili paste is that is needed for this recipe? Just curious I do freezer crock pot meals how would i do that with this ?? What could you use instead of chicken thighs ? Could you use some kind of beef or pork also ? How about chicken breast? 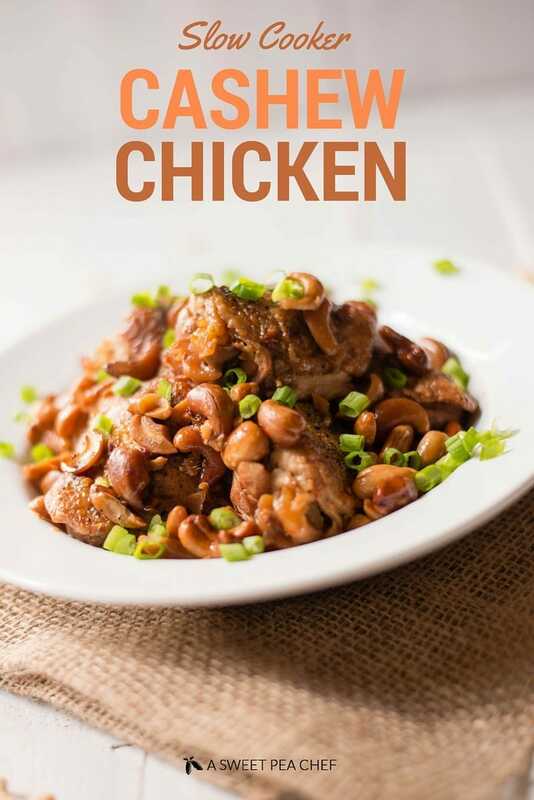 This sounds really good, just don’t like chicken thighs…..
I’ve been meaning to try it with chicken breasts, but haven’t yet. If you try it with chicken breast, I’d do bone-in, skin-on to keep it as moist as possible.